The Manhattan 74 represents superb performance and luxurious comfort. She offers accommodation for eight guests and three crewmembers. Glorious views from the larger upper lounge make entertaining inside a delight, yet the particularly large saloon features a galley and bar aft, conveniently located both for the saloon and the spacious cockpit. On the flybridge, there is adouble Captain's and co-pilot seat - and a large sunlounger to increase everyone's enjoyment. The crew cabin has it's own private access from the cockpit. Recreational equipment includes a jet powered inflatable tender and two personal watercrafts. Captain and first mate are included in price. A professional Gourmet Chef is also available. Additional costs include fuel, dockage, and certain other running expenses. The Sunseeker 74 has four luxuriously appointed statesrooms. The master statesroom and the forward guest statesroom are fully equipped with spacious private ensuites. Two double cabins located further aft, one on port, one of starboard, share the use of a third head and shower. Crew quarter are located separately. 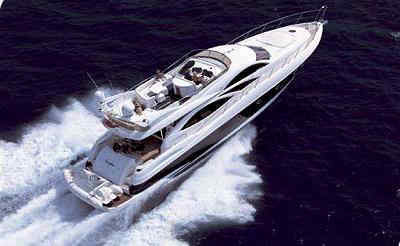 The Sunseeker 74 has all the modern amenities expected on a yacht of such a high calibre. All technical and electronic equipment is available such as electronic echo sounder and speedlog, power-assisted steering, GPS, VHF, radar, autopilot, hydraulic gangway and tender crane, trim tabs, bow and stern thrusters and electric anchor winch. The entertainment system consists of topline equipment - CD and DVD player, flat screen TV's and VCR with surround sound. The galley is fully equipped with fridge, freezer, microwave, oven, grill, dishwasher and icemakers. On deck, there is a wetbar with a hot and cold shower and access to the flybridge from the salon.